Conservatories, just like any other part of the external surface of a building, are subject to the full rigour of the British weather. They need regular checks to ensure that they are kept up to scratch. As we know that leaks will occur with deterioration of flashings, slipped panels, leaking/failed gutters, build-up of debris, leaves and moss build up leading to blockages etc. Not to mention significant loss of light due to green algae growth on the conservatory roof, discolouration of conservatory roof panels, and dead insects in roof panels. Leaks, security of conservatory roof panels, examination of the integrity and blockages in valley and roof gutters, security of glazing bar covers and attachment to hips and ridges, condition of leadwork and flashings, condition of adjacent copings especially important where there are non-cavity walls, seals and integrity of end closures on roof glazing panels, condition of the glazing panels and their seals, correct sizing of the glazing panels and any movement of the conservatory structure, missing components such as end caps and closures, draughts and seals above the window frames, condition of window glazing panels and side members of the conservatory, fit of doors and windows and need for new components and adjustment. Condition report explaining our findings and diagnostics. Options for improvements, and upgrades for winter and summer comfort such as new roof panels/ new roof etc, and costs. Three typical reports in PDF format are shown below. 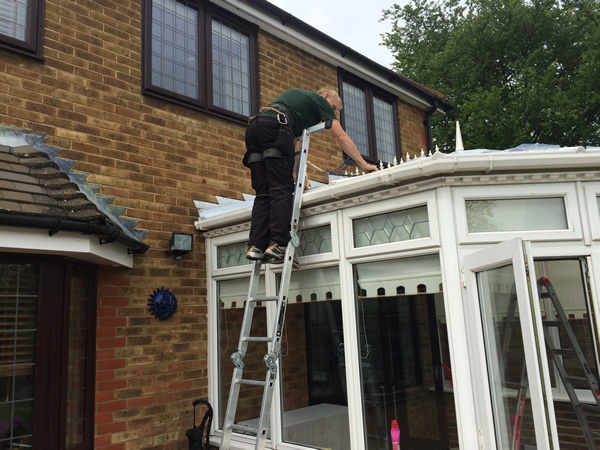 Once you have received our MOT report we are happy to undertake repairs to bring your conservatory back to a good condition. We can also undertake external and internal cleaning to bring back the ‘Sparkle ‘ to your conservatory with our roof and window cleaner and UPVC and Aluminium revive creams. These products have been specially formulated to make cleaning simple and easy and are available for DIY AND TRADE customers. Click here for further information and to order. This report and visit are currently on offer Free of charge with no obligation. To arrange an MOT check please email david@hitg.co.uk, or call free on 0800-8400565.